If you are reading this publication, you already know that running an aerospace and defense manufacturing business is very different from running a manufacturing operation that serves the civilian sector. The differences range from the basic business model to the corporate culture and have implications for the type of enterprise software you need to successfully compete in the market. 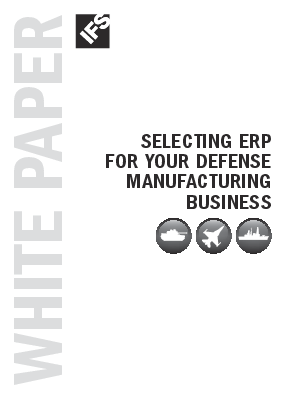 In this white paper, we will discuss how the unique characteristics of a defense manufacturing operation lead to separate and distinct needs in the area of enterprise software including enterprise resources planning (ERP) and software for maintenance, repair and overhaul (MRO) and maintenance activities.